6/12/12 Meria interviews Peter Janney, author of the excellent book “Mary’s Mosaic, The CIA Conspiracy to Murder JFK, Mary Pinchot Meyer, and Their Vision for World Peace”. Peter was best friends with Mary’s son Michael; What kind of woman was Mary? What did she know? Why was she assassinated? 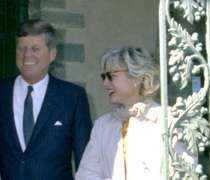 CIA wives; Peter’s fathers part in the conspiracy to kill Mary; CIA & drugs; can’t control free will; LSD & MKUltra; Using psychedelics for world peace; JFK’s lover and friend; Katherine Graham a CIA asset; what happened to Phil Graham? CIA’s control of the media; Mary killed weeks after the Warren report was released; CIA orchestrated JFK’s death; the cover-up; the patsy – Ray Crump; The lawyer Dovey Roundtree; JFK’s speech on 6/10/63; the movies “13 Days” and “Executive Action”; JFK murdered by domestic opponents; 50,000 papers plus not released on JFK until 2029 and more. Meria HIGHLY recommends this book. Your subscription keeps this show going and growing. Subscribe today for this show and total access to the site. Thank you. Certainly, having heard you interview Peter, I’d be more than pleased to do an interview on your show. First things first – let me mail you a book and we’ll take it from there. Many thanks for your interest in Dovey Roundtree.